SANISPLIT 1 is a macerator box. 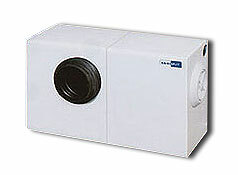 It can be connected to any type of WC with a wall discharge to European standards. The locking occurs by insert the WC discharge into the rubber coupling on the tank and fixing it with the clip supplied. The outlet and other pieces of bathroom or kitchen equipment are connected to the back of the appliance so that all those pipes, connectors, valves etc. that inevitable spoil the appearance of a bathroom can disappear. However the possibility of connecting pipes externally exists. You can also buy only the engine or single hydraulic part of Sanisplit. Replace the engine is a very simple operation.